Asturias: an unknown but remarkably beautiful region of Spain! With its combination of beaches, mountain ranges, natural parks and caves, Asturias is the place to go if you can't decide between a holiday in the mountains or at the beach. 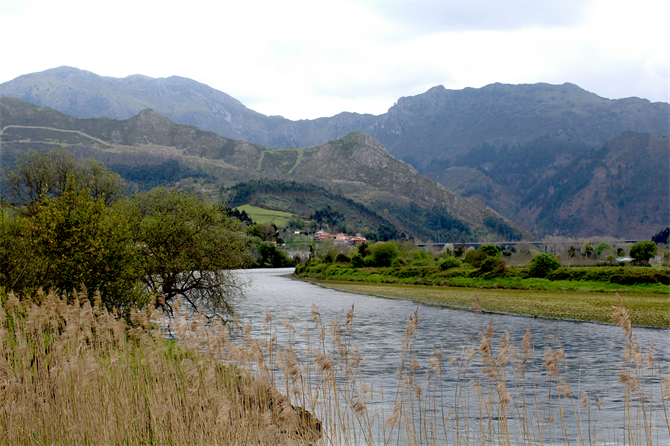 For a holiday immersed in amazing landscapes and pure nature, Asturias is your dream destination. Let's start at one of the most important cities of Asturias which has managed to conserve that authentic fishing-village vibe where its roots lie. Gijón has a seaside promenade to die for, which goes from the centric San Francisco beach all the way to the small peninsula where the old city centre is located. Thanks to its numerous parks, squares and museums, travelers - and especially families - will have a great time in Gijón, and even more so when you rent a Gijon holiday villa. The nightlife in Cimadevilla, one of the hottest neighbourhoods in Gijón, is quite spectacular as well. Your visit would not be complete without a trip to the cultural centre Laboral Ciudad de la Cultura, which houses exhibitions of all kinds and an enormous botanical garden of more than 25 hectares. Ribasedella is the hidden pearl of Asturias and it has everything to become you favourite Spanish village. Its location is magnificent: in the bay formed by the estuary of the Sella river, surrounded by high mountains, beaches and steep cliffs. Ribadesella is known for its two caves, the Cave of Tito Bustillo and the Cuevona of Argüelles, a natural heritage that will leave you speechless. Prehistoric drawings of more than 14,000 years old have been found in those caves - some of the oldest prehistoric art in the world. Ribadesella is also very close to another remarkable cave: the Cuevona of Cuevas del Agua, which provides access to the small town of the same name and can be traversed on foot or by car. The best way to discover Ribadesella is by walking along the long promenade. It starts at the dinosaur tracks hidden in the cliffs of Santa Marina beach, goes parallel to the beach and will take you past the Indian Houses (villas constructed by Spaniards who went to America and returned rich). When it reaches the port it veers off towards Monte Corberu, the mountain that protects the village from the eroding force of the sea. Stairs lead all the way to the top, where you can enjoy a panoramic view of the town and the surrounding landscape. If you are looking for a holiday home in Ribadesella, take a look at our Ribadesella holiday accommodation, specifically selected for their comfort, views and location. In the city centre there are plenty of restaurants, shops and confectionery stores that offer a wide variety of local gastronomic products such as "Leticias", pastries that are typical of Ribadesella and the surrounding villages. 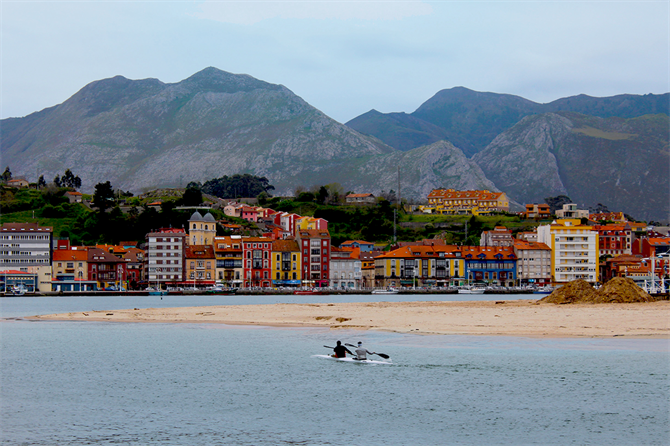 In the east of Asturias you can find one of the most visited villages of the region. Llanes is close to various amazing beaches, like the Cuevas del Mar beaches or Playa de Gulpiyuri, the beach without a sea. But there is much more to Llanes than its surroundings. The seaside town has plenty of amazing vantage points and a small historic centre with remains of a medieval wall, a tower from the 13th century and the Gastañaga Palace, from the 15th century. Without a doubt, one of the most iconic images of Llanes is that of the Cubos de la Memoria (Memory Cubes), a series of brightly coloured cubes by Basque artist Agustín Ibarrola. They represent the cultural, artistic and historical heritage of Asturias. Woody Allen himself describes Oviedo as a city that seems to be taken from a fairy tale. The Asturian capital has a beautiful historic centre filled with amazing buildings that invites you to wander through its streets. You can enjoy many architectural feats which house museums, theatres and other things, but the centre's true protagonist is the Gothic cathedral, built in the 15th century. Just outside the city you can climb the Monte Naranco, which has spectacular views of the city, the surrounding valleys and, on a clear day, the Cantabrian Sea and the coast of Gijón. Another obligatory stop on the Monte Naranco are the buildings of the Conjunto Prerrománico Asturiano (Pre-Roman Group of Asturias), and most importantly the Church of San Miguel de Lillo and Santa María de Naranco. They are thousands of years old and have been declared World Heritage Sites by UNESCO. The place to be at night is Calle de la Gascona, where all the locals come together to enjoy typical Asturian dishes and some glasses of cider. One of the most charming villages of the Costa Verde of Asturias is beautiful Cudillero. With its colourful houses climbing a hillside right next to the sea, it is a perfect place to spend a couple of days, stopping to try the fresh fish and other seafood at one of the many terraces. Take your time to wander about town and discover the amazing views you get when you climb the hill. The small, coloured village breathes an air of the traditional, Asturian way of life. At some houses you can even see fish drying in the sun next to the clothes lines. Cudillero is also close to one of the most famous beaches of Asturias: the Playa del Silencio. Its name (Silence Beach) comes from the steep cliffs that surround it, giving it a peace and quiet that enchants every visitor. Cudillero is just one of many fishing villages in Asturias, so taking a road trip through the most beautiful ones is an excellent holiday idea! Cangas de Onís is the official entrance to the Picos de Europa Natural Park and guards in its centre one of the most important monuments in the history of Spain. It used to be the capital of Asturian Kingdom until 774 AD, and it was in this little town where King Don Pelayo started the Reconquista to reconquer Spain from the Moors. The most photographed monument of Cangas de Onís is the so-called Roman bridge, even though it actually is a medieval bridge constructed on the remains of a Roman one. Underneath the highest arch of the bridge hangs a replica of the Cruz de la Victoria (Cross of Victory), in remembrance of the victory of King Pelayo over the Moors. The bridge is accessible to the public and offers a beautiful view of the village and the mountains around it. A part of the village belongs to the Picos de Europa Park, such as the monumental complex of Covadonga with its chapel located in a small cave metres from the ground and a waterfall originating from a small, natural spring. Another impressive building is the Basilica of Santa Maria la Real de Covadonga, made out of pink limestone and fitting in perfectly with the surrounding landscape. From Covadonga you can access the lakes of Picos de Europa (at about 12 km form the village), a beautiful area with many great hikes and the perfect place to spend a day with the family. 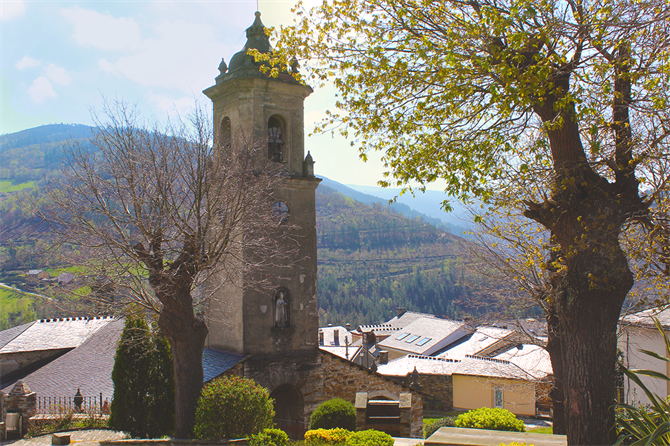 The village Arriondas, very near to Cangas de Onís, is a destination for sport lovers and offers various activities such as kayaking, canoeing, climbing and horse riding etc. It is a great place to spend a couple of days surrounded by nature. From Arriondas it's not far to the famous lookout point Fitu, which offers a spectacular panoramic view of the Cantabrian Sea and the Picos de Europa Park. If you want to enjoy this amazing park to the fullest, why don't you rent a country house in Arrondias? You will have all the comfort and privacy you need for a relaxing stay. Last but not least, we go to the Biosfera Oscos Reserve, where we can find Taramundi. This enchanting village has conserved the most traditional ways of life of the Asturian people. It is famous for its artisan products, especially its pocket knives and its fabric of very high quality. It's possible to visit various museums and workshops where you can discover the secrets of these traditional crafts that are so important to the local economy. There is nothing like walking the Ruta del Agua to discover Taramundi and the forests surrounding it. The Ruta del Agua is a hiking route that connects several small hamlets, crossing paradise-like landscapes with waterfalls and creeks. There are various museums on the route too, such as the Mill Museum or the Weavers' Museum. The best of Taramundi awaits in the recently renovated village Os Teixois, where you can witness the incredible things humans have been able to achieve by using the power of water, such as forging tools, producing energy and movement. Discover how people lived in this region 300 years ago, in an incomparable natural setting accompanied by a guide who gives simple, child-friendly explanations. The best way to enjoy the nature of Taramundi is by staying in a country house where you can fully submerge yourself in nature without compromising on modern comforts. Since Taramundi is very close to Galicia, take advantage of this and rent a holiday home that allows you to not only visit Asturias, but spend a part of your holiday in Galicia too! Do you prefer a luxury holiday? Rent one of our luxury villas in Galicia and de-stress comfortably, surrounded by nature. With the Picos de Europa rising up above the landscape and the Cantabrian coastline providing a lovely route of fishing villages and incredible beaches, Asturias offers you a plethora of magical places to discover with family or friends. So why don't you pay them a visit on your next holiday? Autumn is the perfect time of the year to discover the enchanting nature and charming villages of Asturias. We take a tour of the most incredible beaches of Asturias. Small coves, sandy beaches, rock formations even an inland beach. Just like Spanish Sherry, Cider - or Sidra - is going through a bit of a revival at the moment - grab a glass and join in! Gulpiyuri is hidden away in a series of gentle hills over 100m away from the sea. Quite possibly the weirdest beach you're ever likely to see. Backpacks a-go a-go, Asturias offers the perfect base for a hiking holiday. Follow our recommended routes to discover the best paths and tracks.